I had such a blast drawing this one. So many various shapes, textures, surfaces, shimmering It was a great exercise! Completely blown away by this piece. You captured her so well and such a dynamic pose. Best monster, everyone else: go home. I'm not familiar with the creature or the game, but it looks awesome. If a bit, er, creepy. It's creepy-awesome! I like the way it appears to be twisting and lunging forward here. Very cool pose. And thank you for taking part in creating her design. She's amazing! This is absolutely gorgeous! Great attention to detail and wraith definitely looks like she was fun and challenging to draw^^ Great work! Psst, this game is not PS4 exclusive. OMG ISVOC this is just amazing omg >W<!!! I don't know the game, but this picture is a real masterpiece! I love this game, and the monsters are my favorite part. But this... This is absolutely amazing! Yep, it's definitely online arena game. Not for everyone Thanks! Wraith is the best out of all the monsters so far. My favorite thing to do is activate Decoy and then feed on nearby corpses, and then when it ends you suddenly have armor again and the humans are trying to figure out what the hell just happened. Yeah, she's pretty unique. Too bad she's getting QQ nerf. Thank you! Wonderful and weird! I love those huge scythe-arms. Thank you kindly She's pretty awesome. whoa that is way cool! She's pretty brutal! Have fun! 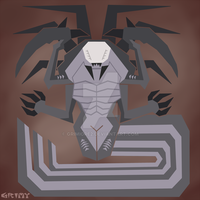 I don't know if you know, but the inventor/concept artist of these monsters is on dA, too. You might want to show this to him, I think he'd like seeing this. Thank you! I do watch him, even faved big chunk of his gallery and got artbook for more of his evolve art Sweet stuff! Thank you so much! I'm glad you like the picture!